Miniature is Troll Champion (#36) from the Shattered Star set of the Pathfinder Battles line of miniatures. Balance-Though Gruoark is somewhat cheap for a leadership ability, I found his need to destroy a figure to activate his bonding and the fact that a few turns of concentrated attacks from squads cause his price to be lower than that of the more reliable abilities of Kato and Ulginesh, but more expensive than those of Kurrok and Kantano Daishi. His healing makes him hard to go down if the opponent is having a hard time rolling skulls, but his defense is low enough that even the lightest hits can draw blood. Playability-Gruoark is very big and needs to be put on a double base. His large sculpt and weapons are responsible for his life of 8 and attack of 6, while his lack of armor is the reason for his low defence of 2. Creativity-Gruoark adds a frontline healing leader to the game. 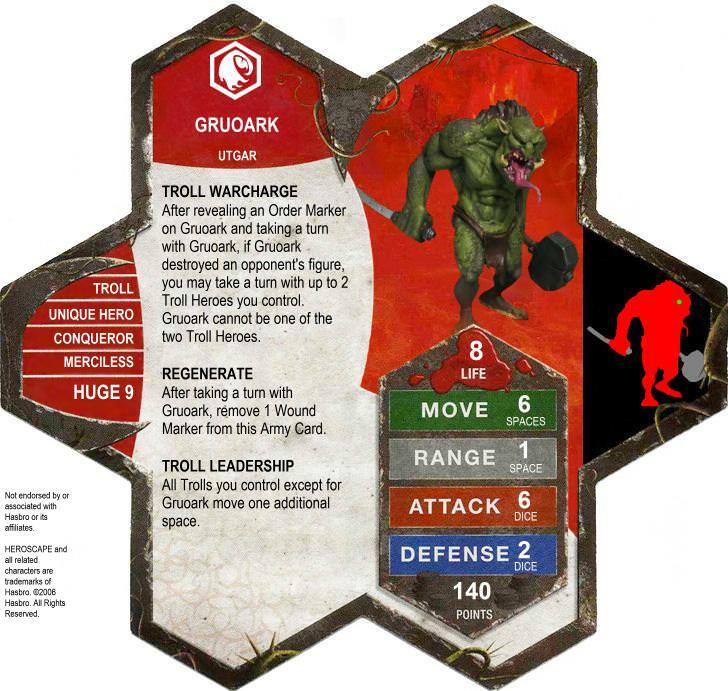 Most armies with a leader figure require you to have the leader stay back, but not with Gruoark who can take hits and heal them while commanding his trolls. Theme-The trolls so far in HS are all visually different and aren't united as a whole. Gruoark unites them and makes them into a force to be reckoned with. Gruoark is from Toril because of his similar hide to the feral troll even though they have very different facial features. Gruoark looks ridiculously strong in heroes-only and dungeon-crawl scenarios. Have you played the D&D Scenarios? The Feral Troll may seem like a chump in Tournament-style games, but throw him against a figure that can only match him attack-for-attack and he is very hard to beat. Have you played Gruoark in those kinds of scenarios? No, I have not played him in a dungeon crawl, but in a dungeon crawl against heroes his bonding power usually does not come into play. So in essence playing against him in a dungeon crawl he's just a beefed up feral troll with slightly higher defense and with blood frenzy maxed out. In heroes only any ranged build would make short work of him. Raelin and multi-life heroes prevent him from getting kills to activate warcharge. Vydar range, Firestorm and other competitive heroes only builds would do him in for sure. I agree that Gruoark looks overly strong in heroes-only games and dungeon crawl scenarios, but I don't have any issues with the powers, stats, or theme. I don't normally turn down submissions due to possible power level issues, and I won't here. I am almost certain he will prove too strong in the scenarios I described, but I agree with Scytale--that's a contention that must be proven. Even in normal play this troll is really really strong. Goruak + 2 Ferall Trolls = OP Turn. Fortunately it's not every turn. 8 lives 2defense and Regenerate seems very very hard to kill to me. It may look that way at first, but as long as you focus your attacks one troll at a time they go down fairly easily. I usually go with Ice trolls along with the feral trolls for the fast movement and their higher base attack, but they die even more quickly. krug also goes well with Gruoark. Even with all of this squads are still more reliable and effective than the trolls. I love the class "Conqueror" and it's a cool sculpt. One attack of 6 and 2 attacks of 3+ might be hard, but it only works if he kills a figure. If you go for squads to maximize your chances of getting 2 Feral Troll/Krug turns, you are somewhat wasting the attack of 6. Gruoark, Krug, Feral Troll x2, and some filler and/or range could make a fun army, but it could prove too powerful. I'm game to try him out, though. I like the theme and powers. If there are balance issues they will be revealed in playtesting. Gruoark has received 5 Yea votes to review (Scytale, capsocrates, superfrog, infectedsloth, and vegietarian18) and moves on in the process. On the BCoV HQ, someone submited the Rifleman from the mechwarrior solaris vii heavy class action pack (the green and purple one at the top). Availability is currently very low, but the C3V already used one figure from this pack, and I believe they are commited to use the 3 others. So all scapers that own Deathcommander Mark III should already have the figure. Would you consider that OK or KO for availability, if the figure was to be submited to SoV ?